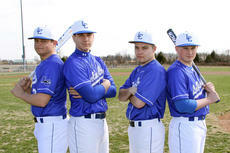 The LaRue County Hawks are starting to get on a roll. With the temperatures in the 30s and the wind chill making it feel more like in the 20s, not to mention snowflakes swirling from the third inning on, the young Hawks pounded out 11 hits and junior right-hander John Selman tossed a two-hitter for a 14-2 rout of the visiting Warren Central Dragons on Friday night. The Lady Hawks used hot bats, strong defense and solid teamwork to open their season March 18 with a sound defeat (13-2) of visiting Adair County. 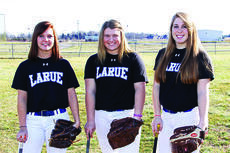 LaRue put away the Lady Indians in five innings. Coach Rocky Cundiff said he couldn’t ask for the opener to go any better. LaRue County senior pitcher Emillee Cundiff had a lot in common with the John Hardin Lady Bulldogs on Monday. Most notably, they both had trouble getting on base. Fortunately for Cundiff, her Lady Hawks teammates had no such issues. Junior second baseman Delany Eastridge was a home run short of the cycle and was 1-of-3 LaRue County players with at least three RBIs as the Lady Hawks pounded out 14 hits in a 12-0 rout of the host Lady Bulldogs in five innings. The Central Hardin Bruins started fast Monday evening, while the LaRue County Hawks never got going. The Bruins scored five runs the first three innings, which was more than enough for the Central Hardin trio of senior Seth Givan, sophomore Blake Wheeler and freshman Brendan Grider, who shut down the Hawks for a 5-0 victory at Central Park. Central Hardin is off to a 3-0 start after finishing last season with back-to-back losses in the 17th District Tournament final and 5th Region Tournament quarterfinal. 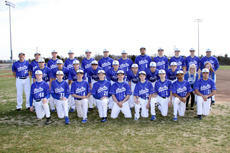 Members of the LaRue County High School baseball team are front from left, Robert Thompson, Dalton Skaggs, Caleb Heady, Matheo Lynn, Tristan Waddle, Ty Morris, Bryson Cobb, Brandon Cecil, Travis Wallace; back, Coach Adam Lindsey, Statistician Keeahna Bowen, Turner Cottrell, Koy Lindsey, Dylan Milby, Dalton Metcalf, Chandler Lynn, Colby Skaggs, John Selman, Jaxon Boley, Cameron Dawson, Dane Milby, Robert Absher, Head Coach Eric Allen, and Statistician Abby French. 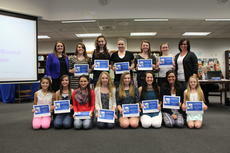 The LaRue County High School Cheerleaders were honored March 16 by the LaRue County Board of Education. The cheerleaders, coached by Renee Wright and Megan Willard, have had an outstanding season on the regional, state and national level. Front from left, Taylor Caylao, Autumn Roten, Montana Metcalf, Darienne Grimes, Allyson Hutchins, Mallory Skaggs, Gabriela Garcia, Morgan Jaggers; back, Coach Megan Willard, Whitney Bauer, Ashlen Grubbs, Emily Miller, Kaylee Hornback, Emma Bowling and Coach Renee Wright. Ten LaRue County Mat Hawks represented their school March 10-11 at the Kentucky High School Athletic Association’s State Wrestling Tournament. 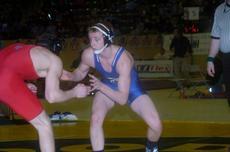 The team was tied in 25th place at the end of the first day’s wrestling, and fell to 33rd by tournament’s end.